Learning how to cook does not always have to be about fancy stuff. The good old stir fry was one of the first things I learnt to cook and has served me in good stead. The trick is in the flavour and a nice hot pan, plus the addition of five spice to the rice gives a nice twist to a plain staple! I have recently developed an addiction to quinoa, which some would argue is better for you than rice due to its higher protein content. Give it a whirl! Each serving provides 590kcal, 40g protein, 61g carbohydrate (of which 8g sugars), 19g sat (of which 4g saturates), 4g fibre and 0.4g salt. First cook the rice. Put the five spice in the bottom of a medium pan over a low heat. Cook for about 3-4 minutes, or until you start to smell the aromas, then add the rice or quinoa along with a little salt and cook it according to the pack instructions. Meanwhile, put the cashew nuts in a large wok (without any oil) over a medium heat and toast for about 3-4 minutes, giving them a shake from time to time until golden-brown all over. Then tip them onto a plate and set them aside. Heat the oil in the wok with the heat turned up to high. Season the chicken pieces with salt and pepper and stir-fry for about 4-5 minutes, stirring occasionally, until golden-brown. Add the peppers, spring onions, chillies and ginger, and cook for 2-3 minutes keeping the pan moving so nothing burns. Add the garlic and cook for another minute. Place the cornflour in a small bowl with two teaspoons of cold water and mix to a smooth paste. Add to the stir fry along with the stock and hoisin sauce and let the sauce bubble away for 1-2 minutes, or until it thickens slightly. 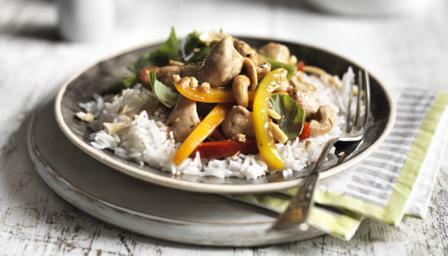 Toss the toasted cashew nuts into the pan and check that the chicken is cooked through. Remove from the heat. The rice or quinoa should be cooked by now and so drain, season to taste with salt and pepper and then return to the pan to keep warm if necessary. Spoon the rice or quinoa onto each serving plate. Spoon the stir fry between them and rip up the basil leaves to scatter over. Serve immediately.